The book is the book is the book. 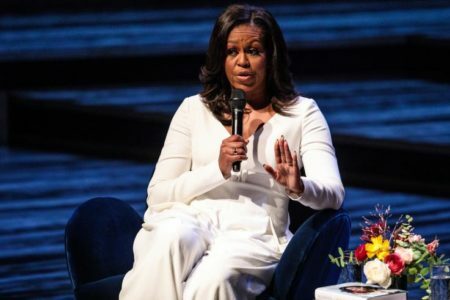 As used by Michelle Obama, the term ‘Imposter Syndrome’ is, I suppose, what used to be called ‘low self-esteem’, in that it refers to the feeling that you don’t have the right to be here. ‘It doesn’t go away, the feeling that you shouldn’t take me that seriously. What do I know? I share that with you because we all have doubts in our abilities, about our power and what that power is,’ said Michelle on stage in her London interview. The term was coined in a 1978 paper by psychologists Pauline Rose Clance and Suzanne Imes, who noticed that successful women can feel their achievements are down to luck. Of course it also extends to men, and ‘Imposter Syndrome’ strongly affects writers. You can work all your life in corporate companies without ever being publicly judged on your work. You are part of a team or a division, and you reflect the fortunes of the company. If it’s doing well people happily suggest that it’s at least partly down to you. If the business tanks you can change jobs and take something else in your field. I have friends I’ve known for decades whose jobs are still a mystery to me, not through lack of trying to understand but because they are facilitators, negotiators, media manipulators, disseminators being paid handsomely to produce intangible product. There’s a delightfully Kafkaesque novel by Keith Waterhouse called ‘Office Life’ in which the hero sets off on a journey through his company to find out what on earth it is they do. Of course he eventually discovers (hardly a spoiler alert) that they don’t do anything. For a corporate executive, a well-performed job is not necessarily a benchmark of talent so much as survival instinct. For a writer, the book is the book is the book. It comes out and lies there, waiting to be judged. And those who judge it judge you. But long before we reach that stage, writers start out with nothing but the vaguest sense of a few ideas. Although I started writing short stories as soon as I could hold a pen, I was crippled by a debilitating shyness and lack of self-worth that as a teenager made me alternately introverted and aggressive. It took years to find the courage to write anything because I felt like a fake, mimicking the actions of others. The snobbery of one’s supposed peers can be horrendous. I was once at a gathering of newspaper feature writers, all white Oxbridge males, who literally laughed in my face when I said I was trying to write a collection of short fantasy stories. There has always been a coterie of writers – many in the extended Bloomsbury Set were entirely devoid of any talent but dilettantism – who sneer at any kind of popular fiction, for to find true success is to publish a slender volume of verse printed in editions of 200. It amazes me that anyone can be so determined as to produce something at the outset of this excursion into ritual humiliation.We find role models, copy them badly and eventually find our own feet. I was introduced to a grand county lady who turned out to be an agent, and she invited me to a party. I remember being terrified. I didn’t talk enough, I talked too much, I left feeling horribly ashamed of my gaucheness. I’ve since been to events for new writers held in friendly old pubs, where the writers have hovered outside the door, too conflicted to come inside. Once you become ‘respectable’ (a state that has happily eluded me) you get a better class of invitation. A high table dinner at Oxford, an awards ceremony at Mansion House, an invitation to speak at a press luncheon. And you may find yourself sitting between an astronomer and a diplomat. Or, in my case at last year’s Yeovil Festival, stuck in the back of a clown car with Michael Portillo. You have to find the confidence to hold your own in any situation that’s thrown at you. I still feel like an imposter; right now I’m working on a thriller entirely built around the notion of family mistrust. It’s an area beyond my comfort zone, and I know a number of great authors who write this sort of thing beautifully. If I succeed in getting it published I’ll be with others who are far more experienced in the field, and the notion of being an imposter will return again. It never goes away entirely. Being a woman, it was a given back in those olden days that low self-esteem was an automatic gift from your good?godmother. Those were the days of being told, “you wouldn’t understand,DEAR! ” and “I don’t want to talk to you, I want to talk to a man,who will know.” Uurrrgghhh! Being naturally very shy, I almost went under(while muttering epithets under my breathe) but gradually learnt and was told by others that I did know what I was talking about and if ‘they’ didn’t understand it was their lookout. Oooh,I enjoyed that rant! Btw,one of my favourite lines from a film/show was said by Shirley Maclaine in Sweet Charity when she is taken by a celebrity to a party full of other celebs – ” gee,I’m the only person here I never heard of “. I have used that a few times in my life. Thank you,Chris,for reminding me of that Keith Waterhouse book. I remember finding it very funny because I’d been in a large organisation like that and then when my sons went off to work,they seemed to be in similar workplaces but as all job descriptions had changed so much in the intervening years, I used to be at a loss to describe to others what they did. Of course,when it was explained to me, I realised that the jobs were exactly the same,but someone had come up with new titles for them from the dictionary of Jargonese. Imposter Syndrome and low self esteem are not equivalent. The first team refers to Being Made to feel inferior, that your accomplishments are worth nothing, through our racial and sexual brain washing process. E.g. Mrs. Obama wanted to attend Princeton University–her grades, community work, intellect indicated she could. Mrs. Obama was discouraged by her “guidance counselor”—-told she wasn’t good enough and would never be admitted. When you incorporate these relentless, often subtle messages, into the way you feel about yourself and behave accordingly, you have the syndrome. If you’re mentally healthy, like Jo W., you learn to fight back; then you’re told you’re uppity, unfeminine, controlling, etc– which is how Mark Judge, journalist, Kavanaugh’s bff, described Mrs. Obama. The beat goes on. It was assumed by my high school that I and a good percentage of our class would go to university if there was a bit of help offered. We paid minimal fees and the school district offered grade 13, the equivalent of first year university. It was minimal in some respects, no psych or philosophy, no calculus and the literature was a little thin to put it mildly. I still haven’t done a modern lit course, but we had enough to get us started and most of did go. I was still terrified of opening my mouth in public and went over every word I’d said when I got home from a gathering – sure that no one would ever speak to me. We can get over those things. When the French department head told the class that anyone who felt the need for grammar and vocab could transfer into another prof’s class but she was going to be teaching 17th & 18th century literature in French. I stuck it out along with the students who had done a course at the Sorbonne, a diplomat’s son who was a native speaker, and so on. I’ve never got up the nerve to submit anything I’ve written because I can see the weaknesses and I have had enough negative feedback for one lifetime. Helen – your story of the French Literature prof reminds me of Paul Dirac. His father insisted that all communication inside the house should be in French. Dirac’s incapacity with language made that impossible for him and he became very much a man of few words. Despite that (and, to make a Brexit dig, being the son of an immigrant), he’s still one of the greatest and least known Englishmen of the 20th century. Of course, Dirac was Oxbridge and so am I. But neither, I suspect, in quite the sense that Chris intended. You may have two degrees from Cambridge, but if you are a grammar school boy and keep your regional accent and study a STEM, you still are not ‘Oxbridge.’ I think it was my final year as an undergrad, going into a pub, a well-spoken male asking me anxiously if I knew the result of the boat race. I honestly replied that I didn’t know it was boat race day. He said, ‘Oh, you’re not a member of the university.’ I replied, ‘No.’ A friend with me was shocked and asked me afterwards why I said that. The fact was that ‘the university’ had a different meaning for the two of us. I guess that we are all members and non-members of undefined, virtual clubs. Exclusion can feel uncomfortable; inclusion opens doors. Too often, you not only feel excluded, but you are excluded. My headmaster, definitely ‘Oxbridge,’ wrote on my school report, ‘He continues to achieve exam results beyond the level of his ability.’ I think that translates as ‘an awkward kid with a Black Country accent … ‘. Fortunately for me, my maths and physics teachers were more sympathetic. Came across the term Imposter Syndrome in Charles Stross’ The Rhesus Chart with the meaning there of a self imposed label of inadequacy. The book came out in 2014.